George Kiefer copyright these Photos and text. 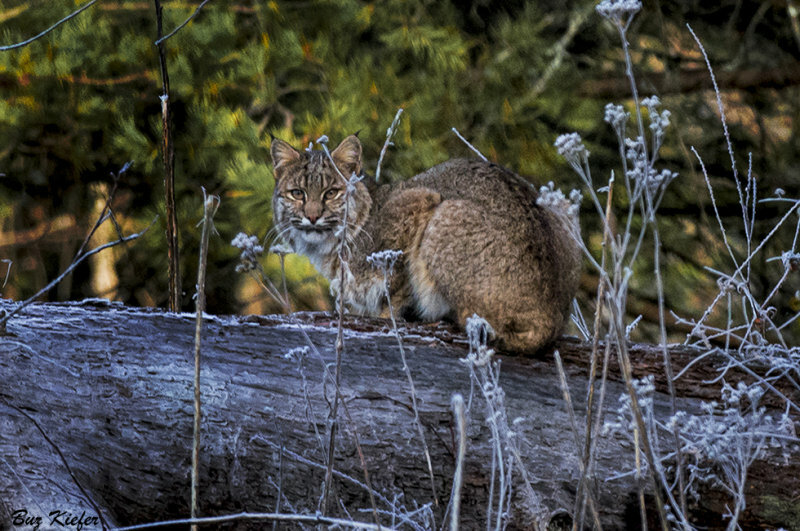 Excellent wild life shot of the beautiful Bobcat. She gave you a perfect relaxed pose. A nice sharp portrait in a natural setting. Of course it got my vote! WOW! This is superb!!! And he's looking right at you! Amazing find and capture, Buz. Great work. It seems to me that it is not easy to meet bobcat. A handful of CAT. Good catch. "V"
Superb shot, would like to see one of these. Awesome. Looks like he's posing for you. Voted. Amazing! An incredible shot of this bobcat look right at you! What a beauty in its natural habitat. Amazing of this encounter. Great results. Great shot of this encounter. Really like the intense eye contact. "V"
Great expression and photo, Buz. Great timing and capture! V! Oh Buz, I am sooooo jealous!! BEAUTIFUL!!!! Wow, terrific capture of this bobcat, who almost seems to be smiling (or growling) at you. V.